Pricing your work and discounts…. What price do I charge for my handmade pen? That is the number one question I always get. My answer is, it depends on the show, and the location of the show. Also, how much did you pay for your exhibit space? If you are only paying $35 for a six foot table at a church bazaar and the people are coming in for free you would have a difficult time charging $250 for a pen. You have to understand your market. If you are paying $1,200 for a 10×10 booth and the guests are being charged $15-$20 to get into the show, then yes a $250 pen will be sold. People coming into a craft show that costs money expect to pay more for handmade items. When you are pricing your item, take into consideration your time (it is worth something – what do you want to pay yourself?). How much did my material cost me and what about the cost of electric and all your tools. These are all factors which should come into effect when thinking about what to charge for YOUR one-of-a-kind masterpiece. 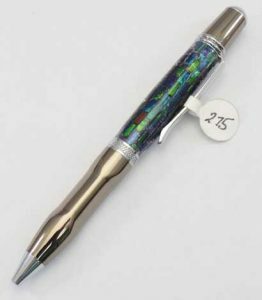 I frequently check out venues for future attendance, and I see other pen makers there charging low prices for pens – like $20 for a bolt action pen!! The person selling the pen tells me they are retired and feels like $20 is a fair price. So, exactly what did it cost them? The pen kit costs approximately $14, he said he got the wood for free? He had to drive over to the house where the tree was (gas money) he used a chainsaw, (how much did that cost?) then he had to come back to his shop and cut the wood up into pen blanks with a band saw (cost for band saw & time spent), then make the pen (time to make), how about the overhead of his electric, tool cost and finishing supplies? All of those factor into his profitability but if they are happy getting $20 for a pen, I certainly cannot change their mind. However, what this does is lower the value of all the other pen makers work. I love this one.. “what if I buy two” can I get a discount? My response was “thank you for asking but these are handmade, I do not buy these from China so when you purchase these I will have to make two by hand to replace them.” That usually politely tells them that you will not give them a discount. In the 42 days at the Grand Central Holiday Craft show, I only had one person tell me that “evidently YOU DO not want to sell anything” because I would not bargain with him, and he walked out. I sold the pen he wanted the next day for my full price! Your work is worth something so don’t let anyone intimidate you because they want a discount! Good article Barry on a question we all face. Most people don’t realize what all goes into making a hand crafted pen. I make pens and a lot of wood toys and other wood crafts. I have found that church bazaars and other free(to the public) craft shows are not good venues for selling high quality pens. There is always someone practically giving them away. Usually of lesser quality. Very frustrating.